Discount Dumpster sends roll off dumpster rental Austin to our customers at low prices with dependable service. Call us today to rent a dumpster in Austin. We’re standing by to help you determine the right size container when you’re ready for the delivery. Our experienced staff can help guide you through the process to rent your Austin Dumpster. 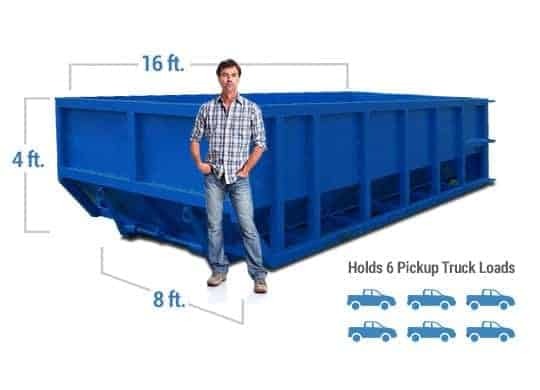 There are several different sizes to choose from, and we can help you determine the right size dumpster for your project. Weight and size are important, and our team can help guide you through rental. 10 cubic yard dumpster rental in Austin are roughly the size of a parking space and holds about 4 pick-up truck loads of waste. The 30 cubic yard dumpsters are typically seen on construction sites. This Austin dumpster is a great size for larger scale remodeling and construction projects. 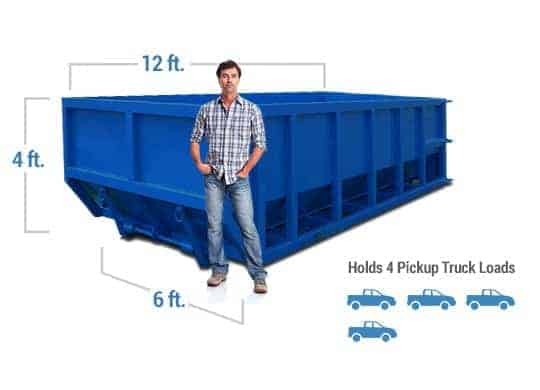 Holding roughly 14 pick-up truck loads, this dumpster will save you time and money when compared to taking your debris to the dump. Working with Discount Dumpster is always a great experience. The dumpster was dropped off and picked up on time, and the communication level was awesome. I thought my dumpster was really good. The office staff were really knowledgeable and answered all my million questions. Great prices! Great communication! Overall a great experience! Thanks! Will use again! Discount Dumpster Rental Austin TX works hard to make sure your dumpster rental experience is easy and issueless. We strive for top-of-the-line customer service for your roll off dumpster rental Austin TX. Call us today and we’ll guide you through our easy dumpster rental process. With our many locations and strong Austin Dumpster presence, we’re able to offer our customers the most competitive prices for their roll off dumpster rental Austin TX. We take our operations very seriously, so those low prices come with outstanding customer service and punctual delivery that exceeds your expectations. When you need a fast, affordable dumpster rental for your residential or construction project, our friendly, helpful staff is here to serve you. Sometimes, your project generates too much debris for your local trash hauler to handle. Whether you’re building, remodeling, recycling, or clearing a patch of land, there are circumstances when nothing but a dumpster rental can handle the load. How much does it cost to rent a dumpster in Austin, TX? Dumpster prices range based on a number of factors but the main factor is the container size and location. In the City of Austin we offer four different sizes; 10 cubic yard, 15 cubic yard, 20 cubic yard, and the 30 cubic yard. Prices start as low as $375.00 and go up to $525.00, again based on size and location. Our knowledgeable staff will be able to determine the most cost-effective roll off dumpster rental solution for you after discussing the details of your planned project. In order to best serve each of our customers we keep prices flat meaning the price you are quoted is the price you will pay. That means delivery is free, hauling is free, final pickup is free, and sales taxes are included. Do you need a permit to have a dumpster on your property? The type of permit and amount to be paid depends on the project and type of work to be completed. Under normal circumstances permits are not usually required for a rental dumpster, unless you are placing it on a street or sidewalk. If you do plan to place your dumpster rental on a street, a temporary right-of-way permit (TURP) is issued by the public works or building department of the city. If you plan to place the dumpster in a driveway or on private property, you should not be required to purchase a permit from the city. However, if the property where the dumpster rental will be placed is part of a homeowner’s association, you may need to secure their approval prior to delivery. When you do need to place a dumpster rental on the street, our staff will contact the city to be sure no permit is necessary. Though a dumpster permit is rarely needed, we are able to walk you through the process if you do need one. When renting a container we typically place roll offs on private property. The reason for doing this is to avoid the city permitting process. Why wait to get city approval when there is not a need? For additional permitting information visit the City of Austin Development Services Department. Asbestos, Adhesives, Fuel, Food Waste, Tires, Refrigerators, Air Conditioners, Railroad Ties, Oil, and more. The amount of space you’ll need to accommodate your dumpster rental in Austin depends on the size of dumpster your project requires. To give you a rough idea, a 10-yard dumpster is 12 feet long x 6 feet wide x 4 feet tall and can hold up to two tons of debris. These dumpsters are approximately the size of a parking space and hold about four pickup truck loads of debris. At Discount Dumpster, we offer fast, reliable next day service, so you don’t have to wait to begin your project. Scheduling delivery ahead of time ensures that your dumpster rental is there when you are ready to begin work. Our deliveries start as early as 6:00 a.m. and go all the way to 6:00 p.m. We will send you a text message with your drop off and pick up times.